Half of our focus is on a sharp and lean web site. The other half is on SEO and Marketing. 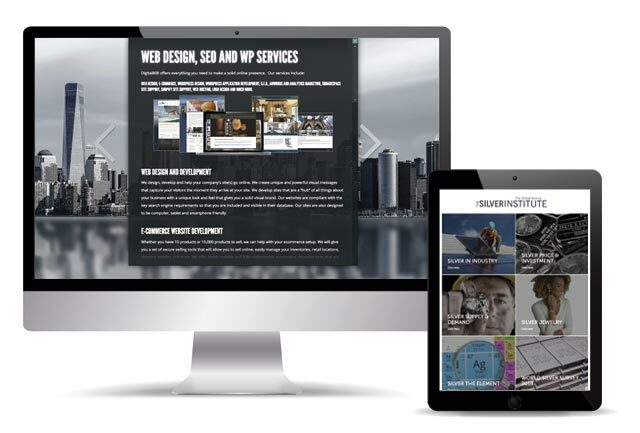 We design, develop and help your company’s site(s) go online. We create unique and powerful visual messages that capture your visitors the moment they arrive at your site. Our sites are also designed to be computer, tablet and smartphone friendly. We work on a design you are proud of and once you approve it, the site coding begins. We develop sites that are a “hub” of all things about your business that includes web tools (calendars, commerce, member areas, etc. ), plus a unique look and feel that gives you a solid visual brand. Our websites are safe and compliant with the key search engine requirements so that your business can be found. SEO Marketing and positioning can be a very complicated process. Search engines have been over saturated with all sorts of tricks and gimmicks to get sites ranked to the top and because of this search engines have implemented very strict rules to follow in order to get good positioning. Our Websites are developed according to good practices and recommendations from the major search engines. For those who are busy or simply need help with content writing, we can help. You know what you are good at and why people want to work with you, but sometimes writing it all down becomes quite tricky. This is where we come in. Once we get to know you, we will collect the necessary bits and pieces of information about your business, the market you compete in and then write up a compelling set of page for your web site. For immediate search engine inclusion we offer Adword Campaigns. This service involves setting up small ads that you will pay per click, writing appropriate ads that targets your audience, their location, demographics and so forth. Lastly this involves building unique landing pages that strictly focus on a particular service or product you wish to promote. The good news is we know how to do it! Many media companies want to create a site, generate the project revenue upfront and move on. This is where we differ. By giving you a successful presence at a very good price, you will grow and we will be your web partner, when you need us. An overwhelming majority of our original clients who started with us over 15+ years ago are still with us! Their market changes, their demographics morph, and we help them properly react to it. Our clients do well and keep on using us when large changes are required. This is why business owners chose to partner with us; long-term vision and planning. Clients who call have direct access to talk me, the owner and main developer. I help to plan and incubate whatever they wish to execute and then I get it done! Over 90% of our clients are still with us. As a business we will occasionally lose someone, but that's inevitable. Almost all of our clients stay with us and continue to utilize our services when they want their site to grow. We work hard to make sure that their site and online marketing campaigns perform well and its rewarding to hear and see the actual results. A ton of our new work comes in from referrals and whats a nicer way of saying thank you than referring a new client to you?! As a designer and owner of Digital808.com web design studio I am available Monday through Friday and I will always pick up the phone. If you go into my voicemail, I call you back. If you email me, I reach out as soon as I can. I have been a web designer since 2,000 and my clients stick with my shop because I make sure they always have someone to help them when need be.